Core casting is a technique whereby a 3 dimensional textured refractory core is placed inside a wax model prior to the main refractory mould being made around it. 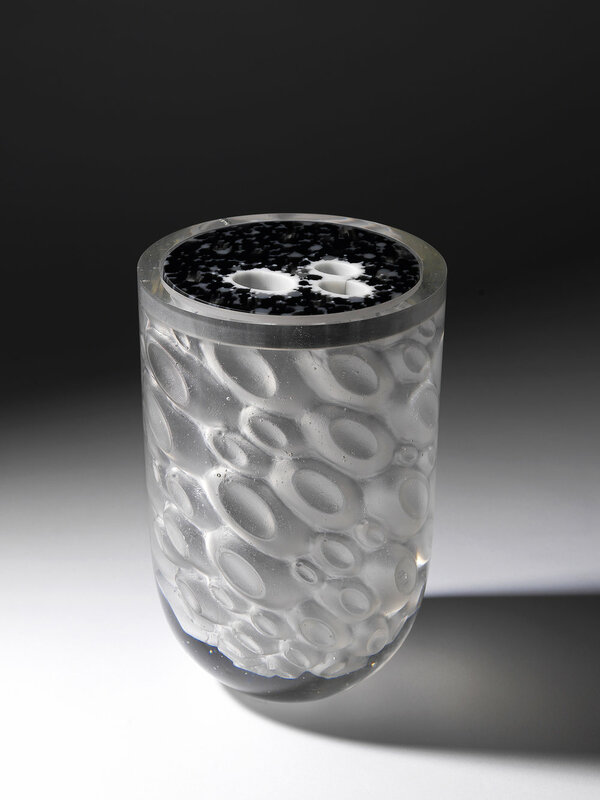 Once cast in glass, the core is removed, leaving a hollow form within the larger object. This is a fully comprehensive course which will teach you the whole process of lost wax casting in glass and core making. It’ll be an intensive and focussed look at what’s possible to achieve in a short space of time. 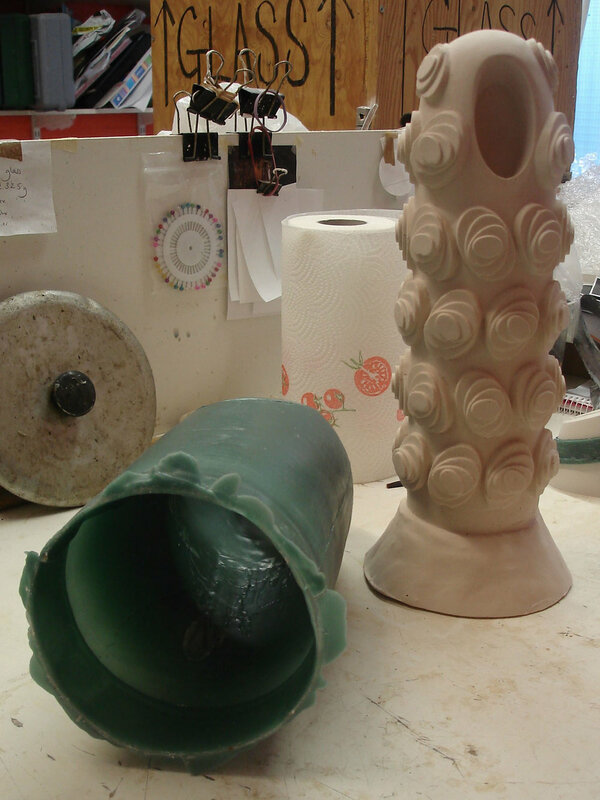 The emphasis will be on working with mould making techniques to achieve 3 dimensional cores within a piece of work as well as moulded texture on the interior of a form. Students will be working with alginate, rubber and silicone to make master moulds, before going onto make refractory cores and setting them into their wax forms. Refractory mould making will then take over, followed by instruction on glass quantities and preparation for the kiln, and finally firing the moulds and learning about kiln schedules. The moulds will go into the kiln at the end of the last day. The structure is very similar to the 3 day Wonderful Wax course with an additional day added for making and setting cores. + Q1 | What are the aims for the course and what will it cover? This is an opportunity to be taught how to do things the right way, step by step from the beginning of the process to the end. The course will teach you skills for life and methods of working that mean you will have all the information you need to be able to work independently. It’ll cover everything involved with lost wax casting using cores to add interior texture and form. + Q2 | Is this course for me? Yes if you want to learn the complicated process of lost wax casting and be taught by an expert who has been specializing in the technique and teaching for over 20 years. Some previous experience is necessary as this is a skilled and specialized technique that involves lots of stages of modelling and mould making. A maximum of 6 students means that lots of personal attention will be given as well as group demonstrations. + Q3 | How many pieces will I make? Most students end up with around 3 moulds going into the kiln on the last day. You may have chosen to focus most of your time on 1 piece, in which case you may only end up with 1 mould going into the kiln – that’s fine - it’s not about quantity, but quality of learning and taking away enough information with you to sustain your own practice. + Q4 | How long is the course? It’s a 4 day course running on Thursday, Friday, Saturday and Sunday from 10 ‘til 5pm with an hour’s lunch break. + Q5 | How much is it? + Q6 | What’s included in the price? Expert tuition by one of the UK’s most well respected glass artists in her own spacious and well equipped studio. All tools, equipment and basic materials are provided. As well as...tea, coffee, a delicious homemade lunch and homemade cake. + Q7 | What will I take home with me? Obviously you’ll have a wealth of information stored in your head, as well as notes and photos that you’ll have taken. You’ll also have plaster and silicone moulds and some wax models that you may wish to keep. The firing process takes approx. 5 days and so the glass pieces will still be in the kiln and not ready to take home at the end of the course – these can be collected at a later date or posted at additional expense. + Q8 | What should I bring with me? Once you’ve booked a place you’ll be sent information on how to prepare for the course and what you’ll need to bring. + Q9 | What can I learn after this? If you'd like to secure a place on the Core Skills 4-day course, please check dates and availability then click the link below to book. You can also learn more general course information and terms and conditions of booking.